Honestly, I had planned to write to you guys while I was on vacation. But then it just didn’t happen. Then we got home and all had to get our first colds of the season. Please forgive my absence. I’m here for you now and ready to share some fun things about Kauai. We tend to think of Kauai as our place. Yup, just for us. I know that’s not true, but it’s been a perfect vacation destination for us over the years. First Trip: My first time there was way back in 2006 and I went with my back-then-boyfriend-now-husband. We were with my boyfriend’s parents who happened to have a house there. It was also on this trip, that my boyfriend decided he wanted to marry me (by the by, the proposal didn’t happen until 2008 - sheesh, what took so long?). Third Trip: We took Caleb in 2017 and stayed with my in-laws (they had since sold the house, sad) who were renting a condo there for the month. Fourth Trip: This was our latest trip, so 2018. Again, we stayed with my in-laws who are living there for a year. This time I was pregnant with baby boy #2. As you can see, it’s a special place for the Brown family! Given, I’ve gone so much, I want to share some of our joyful places from the island with you. I’m going to keep it kid-centric since that’s what I’m all about on this blog. Talk to me if you want no kid recommendations. This has got to be the number one thing to do with a toddler in Kauai. There is sand, there is water, there is endless (almost) space to run and play. Sandcastles can be built. Splashing is a must. And if you’re kid is brave enough, a dunk in the water or a ride on the boggie board. Hanalei Bay (North Shore): We love Hanalei and the beach there is awesome. There is a long stretch of beach, view of beautiful Bali Hai, and a picturesque pier. Sadly, on this last visit, it was not possible to get to the pavilion or pier because of recent storm damage. I’m sure they’ll rebuild, but you can still find ways to the beach! Anini Beach (North Shore): The stretch of sand is shorter, but there are some nice trees that provide glorious shade. It’s is a big reef, which means the water is calm and well-protected. There also happens to be tons of crabs, which Caleb thought was the most awesome thing ever. Lydgate Lagoon (East Side): As you would expect with the word lagoon in the name, Lydgate is basically sectioned off from the ocean’s waves with large lava rocks. The waters are calm and clear. Apparently, you can see some fish, but we didn’t see any on this trip — then again, we didn’t go too far out or have goggles with us. >> More Beaches to check out on this list. 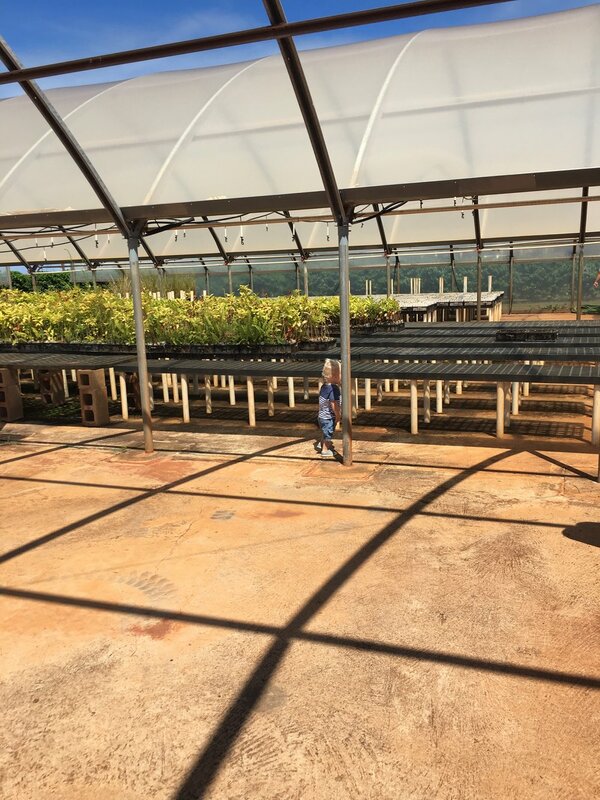 Gaylords started as a plantation is now a visitor destination on the South Side of Kauai, not far from the airport in Lihue. 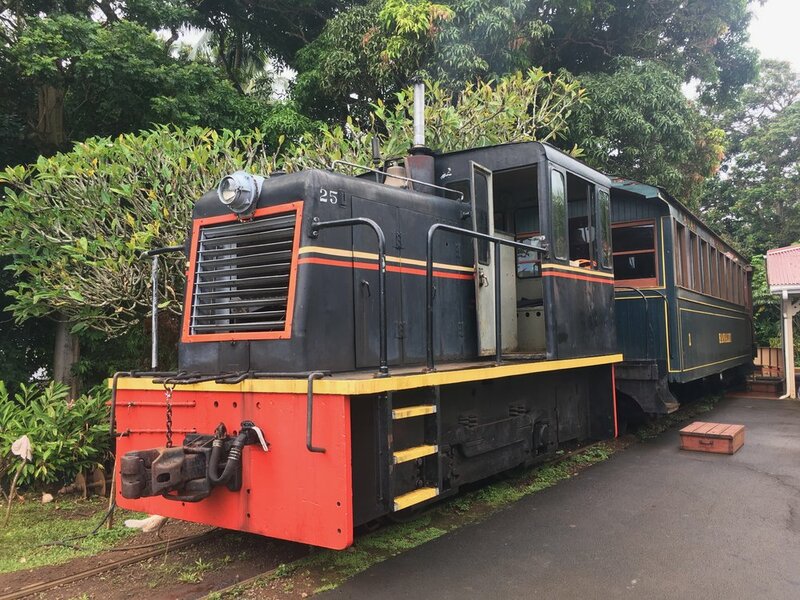 There is a restaurant, shops, a luau, the Koloa Rum Company, and what I really want to share with you, the Plantation Railway. We took Caleb on the train this trip and it was a winner. It’s an old-fashioned train, so it fits every little kids dream train. It’s a 40-minute ride through the plantation, which may seem long for a toddler but there is stop on the way. About halfway through, the train stops and you get out to feed bread to the pigs. Yes, pigs. There is a guide on the train that is pointing out things and sharing history as you choo-choo around. You can point out fruit, animals, train signs, and trees to the kids to keep them entertained. Note: You get a discount if you buy your tickets online in advance. Also, the tours are daily, but only until 2pm — so beware of nap time interference! As you read, we generally stay in a condo with my in-laws when we visit Kauai. However, this past trip, we had the opportunity to stay at the Grand Hyatt Kauai Resort. And, oh. my. goodness. the pool. It’s pretty amazing. The is a lazy river, waterfall, water slide, and best of all a salt water pool that is perfect for kids. I don’t think the water got much deeper than 5 feet and there was sand on the bottom and on the shore. It just wasn’t the ocean, so it mades it a calm and safe place for kids to splash around. Or, in our case, tube around. I’m sure many resorts have some sort of pool setup, so it’s definitely a great option for kids on your visit. I think the Grand Hyatt has stopped offering it, but many places do have day passes that you can purchase. The Kauai Coffee Company is a fun destination in the Southeast side of Kauai to spend an hour or so. 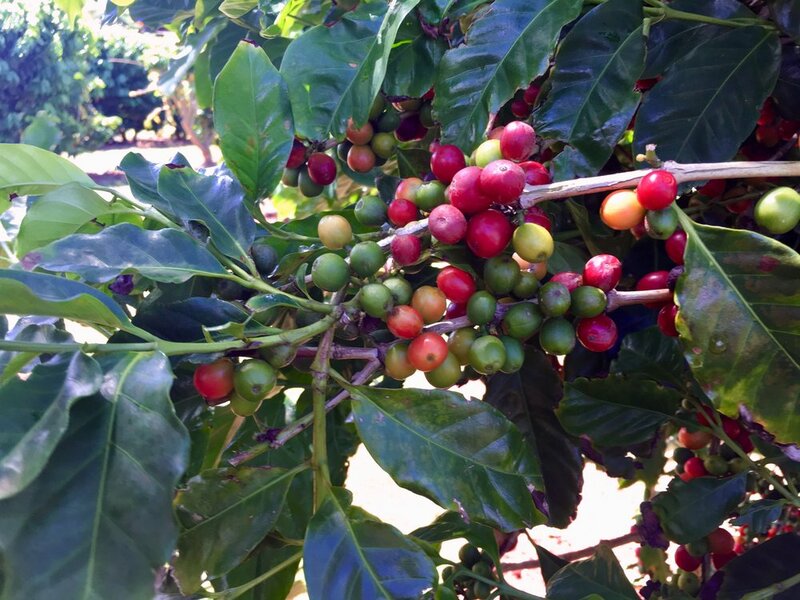 You can take a self-guided tour around the estate and learn how coffee is grown, harvested, processed and graded. I’m sure kids really care about how coffee is made…NOT. But, they can run around and check things out and not get into too much trouble. There is a visitor center at the front with free coffee tasting (and they carry the OnoPops, which we discovered are delicious!). 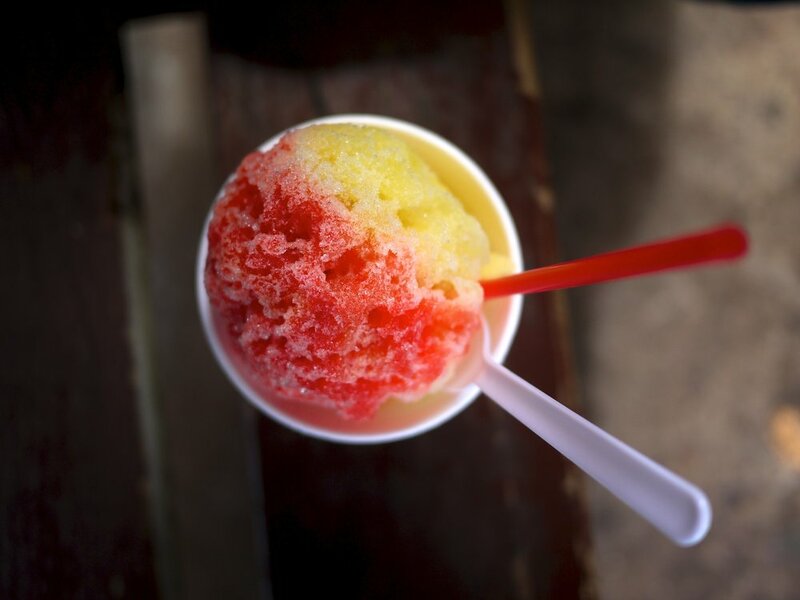 Wailua Shaved Ice - Located in Kapaa, the East side of Kauai. It has some pretty creative flavor combos! Wishing Well - Located in Hanalei, the North shore of Kauai. 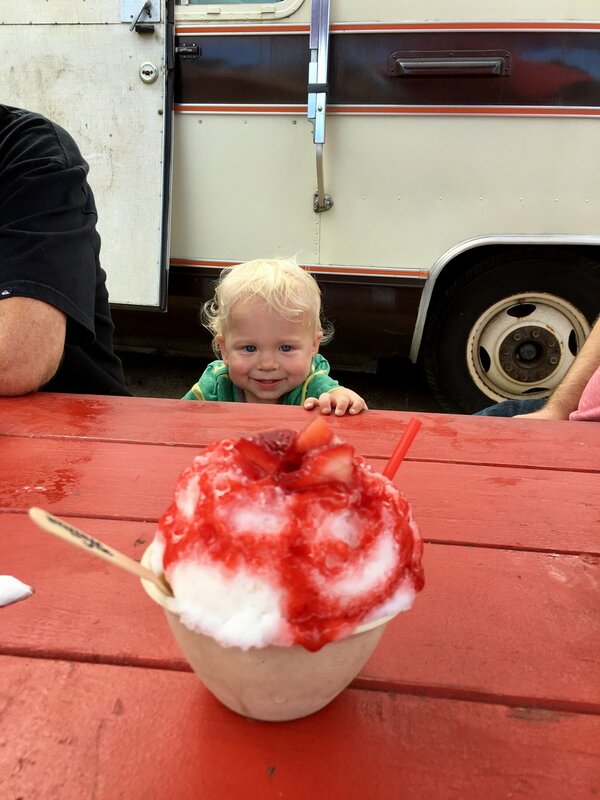 Standard shave ice, but has some tasty organic flavors. 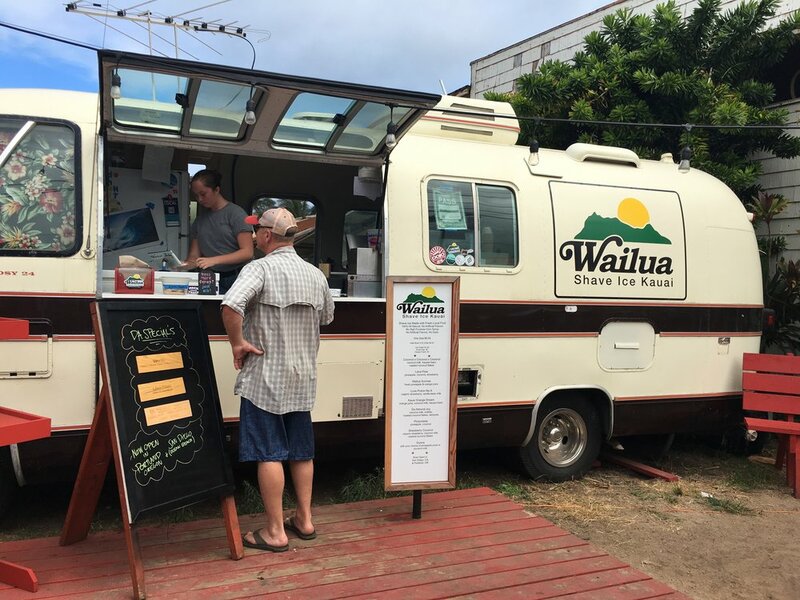 JoJos - There are two locations, one in Waimea (West side) and the other in Hanalei. I prefer the Waimea location! I have shave ice it’s own category because I felt it was deserving it. Here’s a few other places that are kid-friendly either in their dining setup or in the food/drink that they offer, or both! Kilauea Bakery - Located in the Kong Lung Center in Kilauea. We generally go here for breakfast, but it’s good for lunch and dinner as well. It’s super casual and the seating is 98% outside. It’s in a courtyard, so kids can roam if they want. There is also a little kids play table for entertainment. Hanalei Bread Co - Located in Hanalei. You can sit either at picnic beaches, or on their outdoor patio. This place is great for breakfast or lunch and the bread is delicious. They have great pastries and treats, too! Hanalei Gourmet - Located in Hanalei in the same center as Hanalei Bread Co. This is good for lunch. We ordered our food to-go and then ate it on the picnic benches. Hideaway Pizza Pub - This is a great, casual pizza joint nestled away in Princeville. Holey Grail Donuts - Donut truck, enough said. But fair warning, this place is only open Sundays. Something we learned is that you can call your order ahead - the wait can be like 10-15 minutes since they make the donuts fresh to order. They are fun, crazy flavors and happen to be vegan. Kauai Juice Co. - There are several locations on Kauai. They offer kombucha, smoothies, nut milks, and all that sort of stuff. It’s pricey, but what is not pricey on the islands? They don’t necessarily have tables, but it might be a refreshing snack for the kids and you. 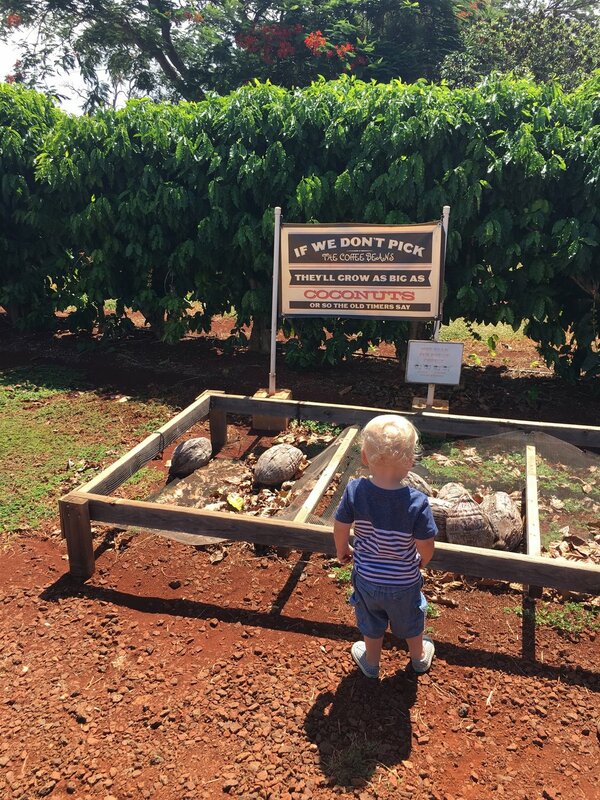 Aloha Roastery - Worth mentioning, but not really kid-friendly per say. Unless, you let your kid drink coffee. Hee hee. But it’s probably some of the best coffee on the island. 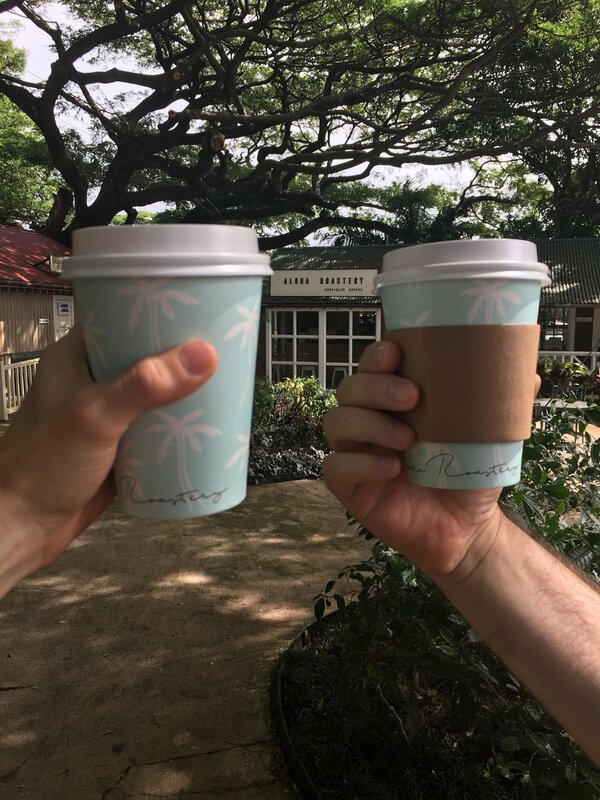 It’s located in Koloa, and you can drink your coffee with the kids place in the courtyard center area. Java Kai - A great breakfast and coffee place in Kapaa. It gets super crowded, but has tasty food and coffee. Cute merchandise as well! Little Fish Coffee - A fun little coffee shop that serves açaí bowls and bagel sandwiches. I loved my breakfast bagel sandwich and honey nutmeg latte. They are uber casual and the food (fruit, bagels, yogurt) are kid friendly. Mark’s Place - If you’re in Hawaii, you ought to try a plate lunch. 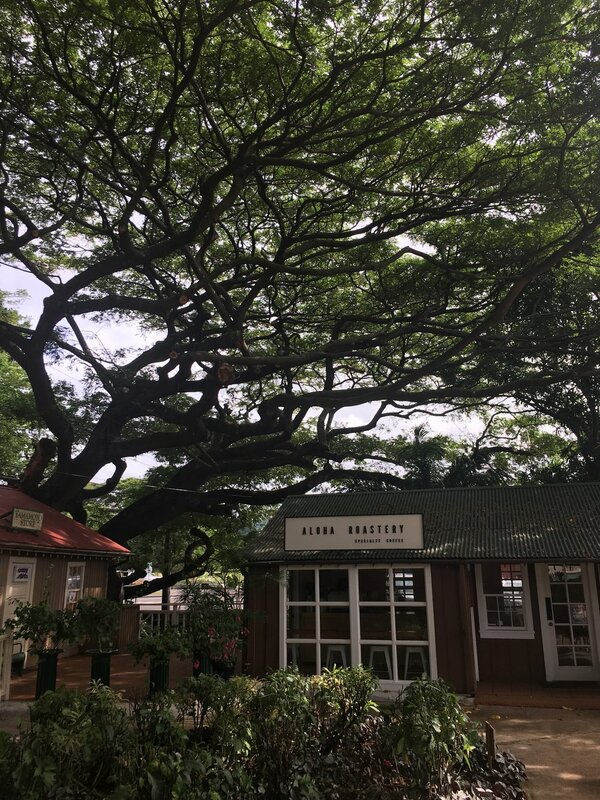 We discovered this place in hidden in an industrial area of Lihue, so you can get it right when you arrive (Lihue is where the airport is located). You eat outside at the picnic tables and the food is scrumptious. Street Burger - Maybe you’re lucky and your kid eats burgers. Mine doesn’t, but we got him to eat some fries with ketchup. That’s a win for me. The place is pretty chill and offers up some delicious burger combos as well as the classics. It’s over in Kapaa, the east side. Taste of Thai - This is tucked away in the Anaina Hou Community Park in Kilauea. The park itself has a playground, mini-golf, farmer’s market on certain days, and a fire show. There are two food trucks and a little cafe. We ate at Taste of Thai, but there is also a Mexican food truck. We got Caleb a PB and Honey from the cafe. I think Josh’s curry was the best, but the other items were pretty darn good as well. Oh gosh, there is so much more. Although it’s closed right now, there is the hike on the Napali Coast called the Kalalau Trail — this is a day hike for adults or for older kids. If your kids are old enough, there is kayaking and zip lining. Also, waterfalls and the Waimea Canyon, the Grand Canyon of Kauai. Let’s not forget to mention, helicopter rides and boat rides. The helicopter ride is totally awesome, by the way.